Plus Size Kitten: Free Laneige Multiberry Yogurt Trial Set! 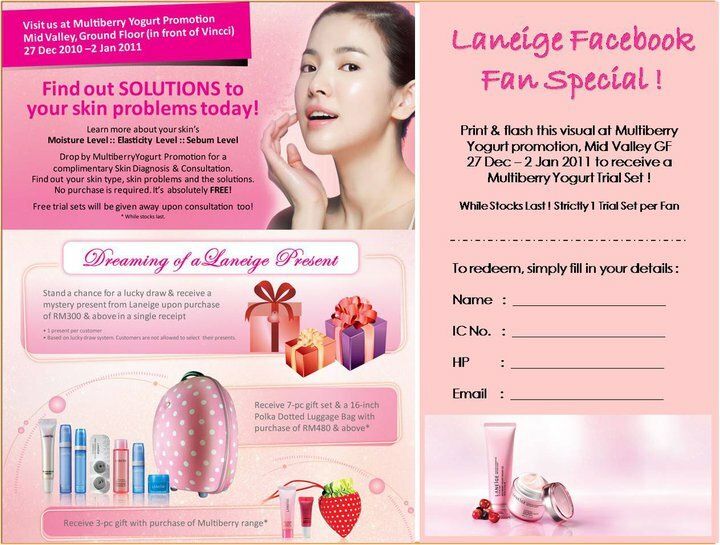 Print this to redeem Multiberry Yogurt Sample Kit! Multiberry Yogurt Promotion @ Mid Valley, Ground Floor from 27 Dec - 2 Jan 2011. Exciting gifts and presents await you ! Hurry, come & join us for the fun this holiday! 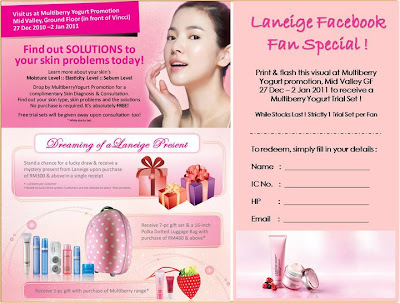 To redeem a sample, simply print and flash this visual @ our promotion area (Tips : To print, right click on the photo & save as picture first) This is for Laneige Facebook Fan Special so don't forget to join Laneige Facebook and print out the photo! Your tag heuer replica sale My spouse and i provides you with your "Bounce Hour" trait certainly not latest inside tag heuer replica uk types. This specific purpose makes it possible for your individual wearing to line your hours side ahead of time as well as in the opposite direction in an hours gets with no unsettling the other as well as instant arms. The next attribute cheap breitling replica of an Replcia Rolex designer watches can be in case they have a specific scenario yet again allowing your movements to get witnessed. omega replica uk under no circumstances built a real enjoy, the exemption staying a number of types through the 1930s that happen to be incredibly rare along with the fresh new breitling replica uk types. You will never discover a realistic Rolex enjoy through an laser engraved agency symbol, design and style as well as Rolex brand on the outside of in the caseback.